You might be wondering… how do I make funeral arrangements? 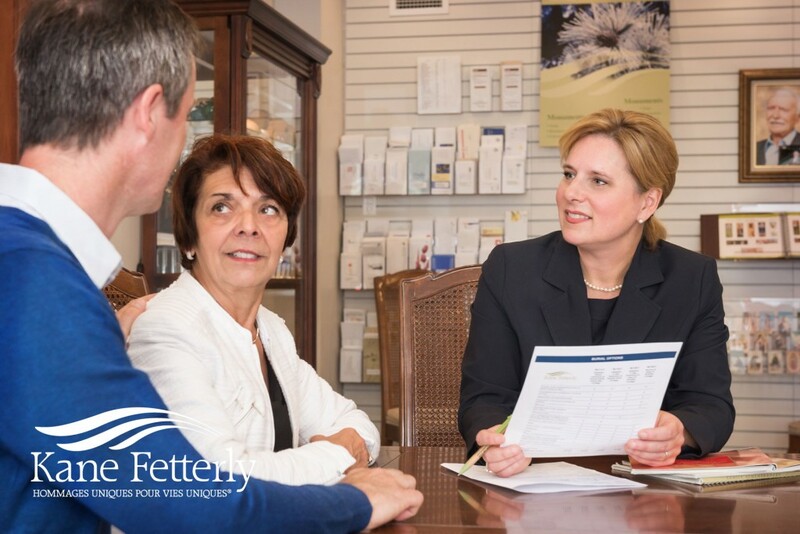 At Kane Fetterly, we do everything we can to make the arrangement process as easy as possible. Number one, participation; we would like as many family members as you can bring. Two, bring your stories about your loved one because their stories are their life. Three, be creative. We will help you with ideas but the possibilities are endless. Four, involve every generation because that’s what family is all about. And five, lean on us because when you are walking this path… we are here to guide you. The first critical element is the participation of as many family members as possible. In general, you should try to have at least three or four participants involved so that the family can reach a consensus on the best way to honour the life of their loved one. Different family members always have different points of view and it’s best to work out any issues as a group. The second critical element is to bring with you some of your favourite stories about your loved one. You won’t have to prepare anything, these will be stories that quickly come to mind when you think of your loved one. The stories you have can help to create a loving farewell that reflects a life lived. The third critical element of an arrangement meeting is to be creative. A good funeral home will never limit how you wish to celebrate the life of your loved one. It can be as simple or elaborate as you would like. Some of the most common things that families bring to our funeral home are items that help them tell the story of their loved one. Was your loved one a craftsman? Bring some of their tools. An avid golfer? Bring their golf clubs. A quilt maker? Bring their quilts. The possibilities are endless. When you bring items like these it shifts the focus off of their death onto their life. The fourth element of an arrangement meeting is that it must encompass the needs of every generation of your family. From elders to infants and everyone in between it is possible to design a loving farewell service that provides healing to every generation. At Kane Fetterly we have specifically designed our funeral home and our style of service to meet the needs of your entire family. For example, we recognize that children may become somewhat bored listening to adults tell stories about the deceased. This is why we have created a children’s corner. While you are sharing the memories of your loved one with other adults your children can be entertaining themselves with toys, movies, and kid-friendly snacks. You will probably have family members who for a variety of reasons will not be able to be in Montreal for the service. For these family members we offer the ability to watch the entire service via the Internet on a private, secure website. Our goal is to involve every family member in the farewell service regardless of age or location. The fifth element of a successful arrangement meeting is that the family becomes comfortable leaning on us. We will design the memorial event together but after that, you can be at ease knowing that we will handle all of the details for you. Remember… we walk this path with families every day. You can lean on us…. we are here to guide you through.